Prepare to race down the chilling slopes of the Old Matterhornthe pre-1978 Matterhorn. Matterhorn Bobsled with four kids. Okay, that long wait in line is finally over. No more listening to the recorded yodeling and “For expediency in loading...” You’re now ready to board your bobsled. Sit down and latch your seat belt. Like an old-fashioned roller coaster, you go clickety-click up a steep ramp in the large, hollow mountain. Though beautifully finished on the outside, the interior of the Old Matterhorn is nothing special to look at. It’s obvious that you’re in a steel-frame structure. At the top of the ramp you enjoy a brief but spectacular view of the lights of Main Street, USA, through an opening in the mountain. Now the fun really begins. You take a series of quick dips and hairpin turns, ending with a splash in a mountain lake. Great ride! For a tame way to see the Matterhorn (unless you’re afraid of heights), try the Skyway, which passes through a pair of large holes on either side of the mountain. 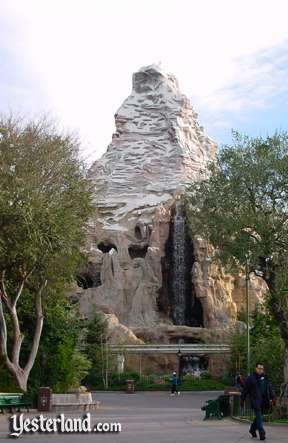 The Matterhorn Bobsleds attraction opened in Disneyland in 1959. It was known for its thrillsand its long lines. 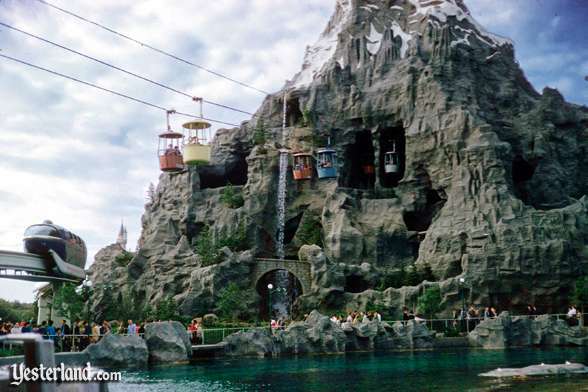 What is the Matterhorn doing on the Yesterland website? After all, the attraction is still running and still very popular. 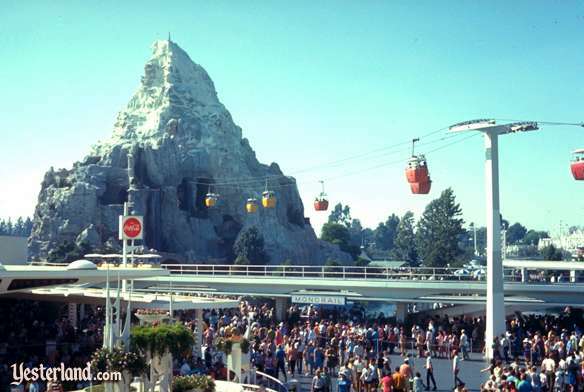 The answer is that the current Matterhorn is quite different than it was in 1959. Matterhorn from the Hub, 1959. Matterhorn from the Hub, 2002. Several scenes of the Abominable Snowman were added. The single-car, four-passenger bobsleds were replaced by two-car, eight-passenger bobsleds, which (along with new computer controls) doubled the ride capacityand shortened the lines. And that first great view was eliminated because the opening was filled in. First roller coaster built by Arrow Development (later Arrow Dynamics), which went on to become a leading, worldwide supplier of roller coasters. When it opened in 1959, the 147-foot tall Matterhorn claimed the title of tallest manmade structure in Orange County, California. It lost the title when high-rise office buildings began to appear in Orange County in the 1960s and 1970s. For a while, three attractions at Disney’s California Adventure exceeded the height of the Matterhorn—the Maliboomer, the Twilight Zone Tower of Terror, and the Sun Wheel. The Maliboomer has been removed, and the Sun Wheel is now Mickey’s Fun Wheel. Matterhorn from the Submarine Lagoon, 1959. Matterhorn from the Submarine Lagoon, 2004. 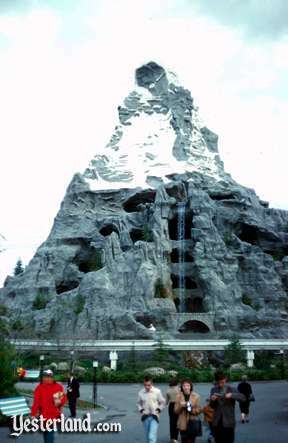 After the Skyway was removed in late 1994, the Matterhorn was again remodeled. The space previously used by the Skyway became a glacier grotto. In 1995, a tribute was added to Frank Wells, the accomplished mountain climber and highly respected President of The Walt Disney Company, who died in a helicopter accident on Easter Sunday, 1994. 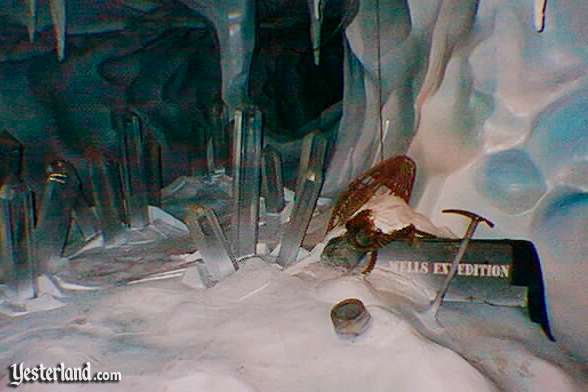 The Wells Expedition scene in the Matterhorn is a tribute to Frank Wells (1932-1994). 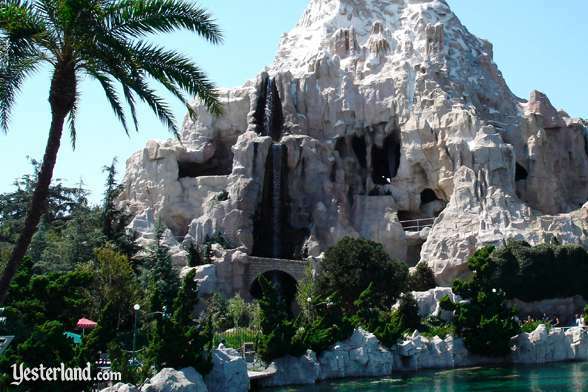 Did you know that the Matterhorn was moved from Tomorrowland to Fantasyland around 1971? No, they didn’t use lots of casters and a really strong tractor. The Matterhorn wasn’t moved physically. From 1965 through 1976, Disneyland guests received 4-inch-by-6-inch Disneyland guide booklets, sponsored by INA, the Insurance Company of North America. 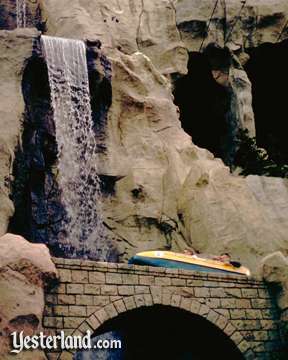 Through 1970 the booklets listed the Matterhorn Bobsleds under Tomorrowland. By 1972, the Matterhorn Bobsleds attraction listing had moved to Fantasyland, where it remains on current Disneyland guide maps. During the 1960s, there seemed to be official uncertainty about exactly where the Matterhorn belonged. For 1961, the back cover of the glossy souvenir book, Walt Disney’s Guide to Disneyland, listed the Matterhorn Bobsleds under Fantasyland. 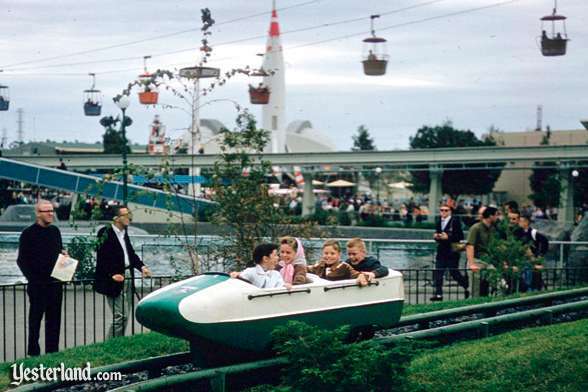 However, inside the book, the ride was pictured in the book’s Tomorrowland section. Some of the confusion might be because the Matterhorn straddles the boundary of Tomorrowland and Fantasyland. 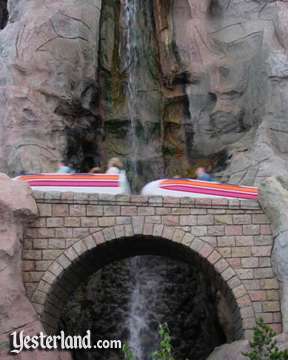 The ride has always had two tracks, commonly called the Tomorrowland side and the Fantasyland side. And, if you think about it, the ride really doesn’t belong in the World of Tomorrow or in the Land of Classic Stories of Childhood. But, in the end, that doesn’t matter. 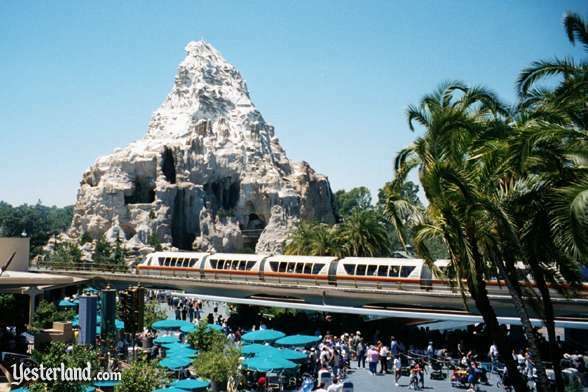 The Matterhorn was a welcome addition to Disneyland in 1959, no matter what land it was in. In June 2009, the Matterhorn was a half century old. And it’s now several years into its second half century at Disneyland. Photograph of four children in a Matterhorn bobsled: Charles R. Lympany, 1959, courtesy of Chris Taylor. Photograph of Matterhorn from the Hub in 1959: Charles R. Lympany, 1959, courtesy of Chris Taylor. Photograph of Matterhorn from the Hub in 2002: Allen Huffman, 2002. Photograph of Single-car, four-passenger bobsled in 1959: Fred M. Nelson Sr., 1959. Photograph of Two-car, eight-passenger bobsled in 2000: Allen Huffman, 2000. Photograph of Matterhorn from the Submarine Lagoon in 1959.: Charles R. Lympany, 1959, courtesy of Chris Taylor. Photograph of Matterhorn from the Submarine Lagoon in 2004: Allen Huffman, 2004. Photograph of Matterhorn with Skyway: Werner Weiss, 1969. Photograph of Matterhorn without Skyway: Werner Weiss, 2000. Photograph of tribute to Frank Wells: Allen Huffman, 2000. Scanned image of Tomorrowland map from Disneyland Guide for Summer 1970: Copyright Disney. Scanned image of Fantasyland map from Disneyland Guide for Summer 1972: Copyright Disney.